This is a premade Camtasia Template. It installs into Camtasia (PC) and you can then just drop it on your timeline and edit the text and other details in it. 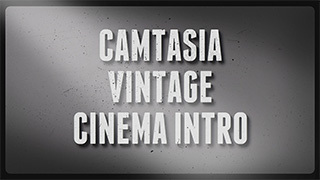 In our latest Camtasia Template we’ve created a vintage styled intro/outro to use in Camtasia (PC). The template includes the backdrop, scratches, music. You can freely edit the text, change font, size, color length etc.